Today I found out the origin of the lolcat meme. It turns out, the oldest known reference to an lolcat style picture/caption dates all the way back to 1903 from photographer Harry Whittier Frees, who would take photos of small animals, including cats, dressed up in various outfits. These photos were then often sold in postcards by Rotograph, the company Frees worked for. Captions were typically added, often by Frees himself, that said things like “How’s the weather out?” and “What’s delaying my dinner?” and “I can haz top hat?” (ok, I made that last one up). 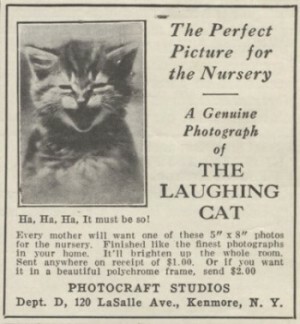 Another interesting example of “cats with captions” was in 1929 in an issue of “Parents Magazine”. This picture (shown below), was originally marketed to be sold in nursery’s. Fast forward a little over 70 years later and we have 4chan. The site that has spawned more memes than Steven Hawking has brain cells… so er ya, a lot. Around 2005, they picked right up where Frees left off, but making a few tweaks; namely: less dressing cats up and more just random pics of cats; using “kitty pidgin” instead of proper English for the captions; and coining the name “lolcat” as early as June 2006. 4chan even had a dedicated day, “Caturdays”, where people would post these. Gradually, thanks to 4chan, these pics were spread about the internet becoming popular on a variety of sites like fark, fazed, vwforums, gpforums, somethingawful, ebaumsworld, etc, but no central site dedicated to them was put up for quite some time. Enter icanhazcheezburger.com on January 11th, 2007. Eric Nakagawa and Kari Unebasami saw the now famous lolcat picture shown below that had the caption “i can has cheezburger?”, which was supposedly originally created on somethingawful. After chuckling about it a bit, they promptly went and registered icanhascheezburger.com and put up a site dedicated to lolcat pictures. The site grew quickly and began getting them in loads of trouble with their hosting provider (you’d think they’d just get a new hosting provider, but here we are). Around April of 2007, Ben Huh “discovered” the site when icanhascheezburger linked to a web page of his. This resulted in a crazy amount of traffic that took his site down (seriously people, get better hosting; this isn’t that complicated) ;-). A few months later, Huh and an investment group offered to buy icanhascheezburger; Nakagawa and Unebasami countered with “i can has 2 million dollrz?”; Huh and they agreed and Huh and his investors purchased the site. Huh’s investment group wasn’t too happy about this purchase initially, “When you tell investors that the site we bought has pictures of cats and not only pictures of cats, but cats with misspelled words on it,” Huh said, “they call their lawyers.” Huh proceeded to implement the age-old business strategy of “do nothing and cross your fingers”, primarily because he, admittedly, didn’t know what he was doing: “Don’t friggin’ touch a thing. There’s a community here. Without submissions (of users’ LOLCats), there’s no content. And without content, there’s no traffic.” Remarkably, this worked and the traffic, which initially had flat-lined steadily rose from about 10 million page views per month to 30 million. The investors promptly stopped complaining. At this point, they made a few changes to the site, hiring a full time employee to screen submissions and adding member accounts, as well as starting a few other similar sites and acquiring sites like failblog. ICanHasCheezburger.com now receives an estimated 1.6 million visitors a day and a couple hundred million page views per month with well over 1 million lolcat pictures in its database. The syntax of lolcat captions was use as the basis for the programming language LOLCODE. CAN HAS STDIO? 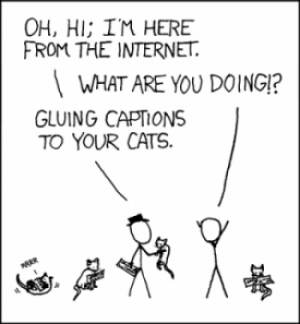 The term lolcat gained national widespread use outside of places like 4chan when Time magazine did a write up on these non-commercialized phenomena now known as memes. Ben Huh. Great name, huh?! ?